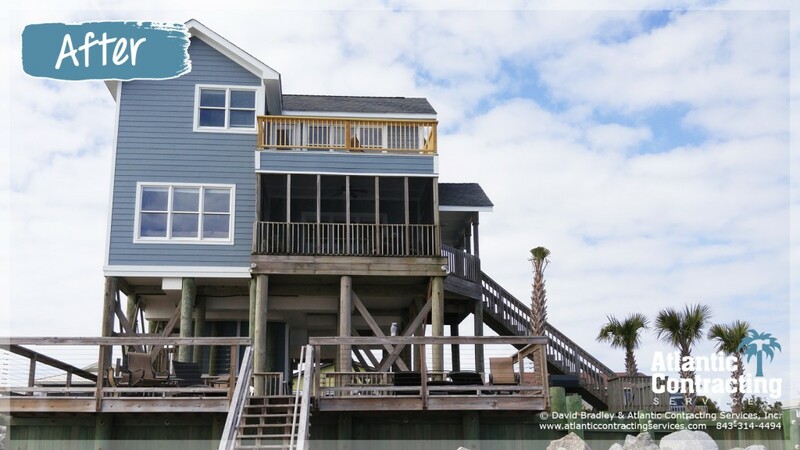 This beautiful home in Folly Beach, SC, 29439 was re-sided with James Hardie siding, ColorPlus BOOTHBAY BLUE, Cedarmill Textured Lap Siding, and ARCTIC WHITE Hardie Trim and Beaded Ceiling Panel. 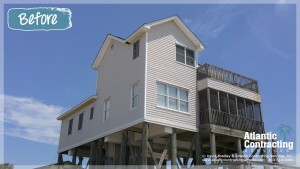 Because of our commitment to quality and our competitive pricing, we were selected to perform an exterior renovation on this home on Folly Beach. We replaced old faded vinyl siding and soffit with James Hardie Fiber-Cement Building Products. We installed ColorPlus BOOTHBAY BLUE Cedarmill Textured 6 1/2″ Lap Siding and ColorPlus ARCTIC WHITE Trim and Ceiling Panel. 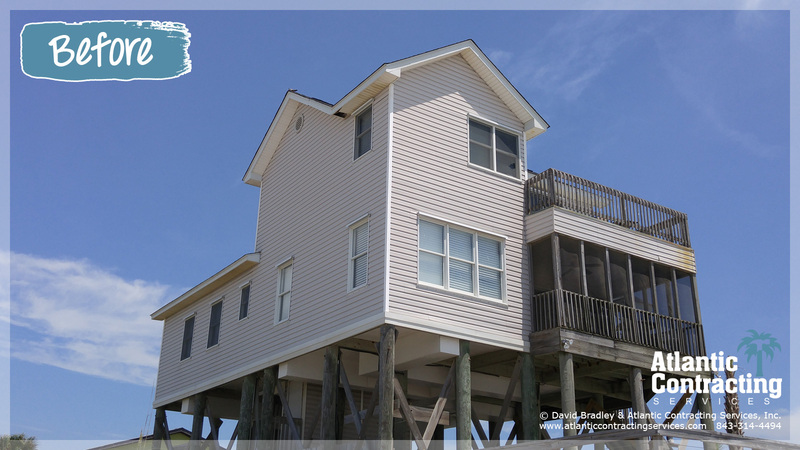 We installed the siding on a 6 ½” lap because the home sits right on the beach and we wanted to achieve a greater wind rating with the installation. The 6 ½” lap instead of the standard 7″ allows us to drop the “blind nails” down and additional ½” which helps to bind the lap siding to the wall. It also gives a nice tight appearance and a busier look because the spacing between laps is less. See our full line of remodeling services and request a FREE estimate. Check out the before and after photos to see the remarkable transformation that a quality Hardie Plank Siding Installation can give. 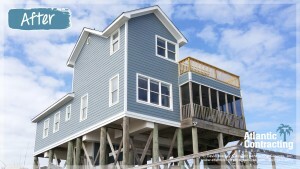 We are your siding installation specialist. 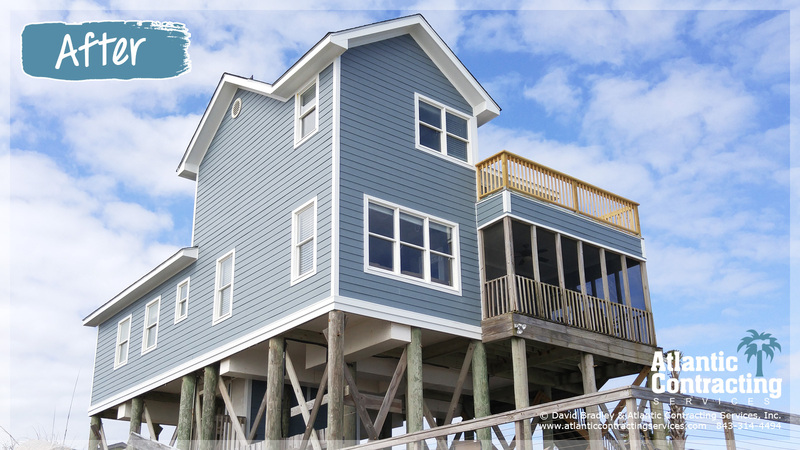 Whether you are located in Folly Beach, Kiawah Island, Seabrook Island, Mount Pleasant, Awendaw, Isle of Palms, or on Sullivans Island, SC we are your safe choice as installers of James Hardie fiber-cement siding products. David Bradley answered questions and requests in a timely fashion and provided pictures of progress which was nice since we were not available on location. Atlantic Contracting Services is happy to provide you with a free renovation analysis of your property.